Purdue’s one-year Master of Science (Marketing) program provides a specialized education, either immediately after graduation or after acquiring some work experience. The program helps students develop the knowledge and skills needed for a variety of marketing positions. Graduates are likely to assume a position in brand management, marketing consulting, marketing research/analytics, or business development. The MS (Marketing) program builds on Purdue's outstanding reputation in Marketing. The MBA in Marketing program at Purdue University's Krannert Gra duate School of Business is ranked #3 Marketing Program in North America (Best-Masters) and #16 graduate marketing program in the United States by the Financial Engineer. Purdue’s MS Marketing program provides students with the knowledge and skills needed for a career in marketing. Our curriculum includes learning application tools that are essential for marketing. For analytics focused marketers, we offer courses that teach advanced tools such as R and Python for marketers. Various elective courses, consulting projects, and small group immersion courses provide students many opportunities to tailor the program to their career plans. “Learning-by-doing” activities such as consulting projects allow students to apply concepts that they are learning in the classroom to real-world problems. Active-learning projects supervised by Purdue faculty members help students turn expertise into experience and classroom knowledge into career success. Elective courses provide an in-depth knowledge around a focused topic. Immersion courses allow a small group of students to work closely with a Krannert faculty member and an industry expert to solve a current marketing problem. Each student is matched with a Career Coach from the Krannert Professional Development Center. These professionals provide career advice throughout the program. Opportunities to network with Krannert alumni and meet various business leaders and entrepreneurs. STEM Classification Announcement: The MS Marketing program is a STEM certified program (for details regarding the associated STEM OPT extension, please visit the USCIS website). To the extent marketing is both an art and a science, the program is a good fit for a variety of backgrounds, such as social sciences, health and human sciences, engineering, computer science, statistics, business, and communications. The target class size is 20 to 25 students. Preference for admission will be given to those applicants who will benefit most from the program and who will add to the learning experience of other students in the program. 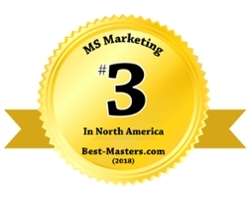 Thank you for visiting the MS (Marketing) website! Would you like more information, or do you have a question for our MS (Marketing) team? Click here for additional testimonials and a video about how Krannert can help you reach your goals. Would you like to learn more about the Purdue University campus? Click here for a guided virtual tour.